The new ‘green’ biomass cookstove has immense potential but why is it missing in homes? It looks like work half done. The Ministry of New and Renewable Energy (MNRE) launched a scheme to make India’s rural kitchen smoke-free by using less biofuel in its improved biomass cookstove. But it forgot to formulate a sound marketing strategy and did not factor in the project’s investment cost. Result: the project made a start but little progress even a year after its launch. As part of the National Biomass Cookstove Initiative (NCI), the ministry launched the project in nine states in collaboration with scientists and nonprofits on December 2, 2009. It also decided to bear 50 per cent cost of the stoves’ production. But neither did it subsidise the stoves to popularise it nor make the huge investments required. The states where the project was launched are West Bengal, Odisha, Uttar Pradesh, Uttarakhand, Rajasthan, Jharkhand, Madhya Pradesh, Karnataka and Andhra Pradesh. The government had launched a similar scheme in 1983, but it was scrapped after found unfeasible. At present, the ministry’s responsibility is only up to the certification level after which manufacturers will be free to sell and promote their products. “We will look at spreading awareness and leave it open to the market,” said B S Negi, director, MNRE. The improved cookstove aims to replace the traditional chulha that has adverse health effects because of the carbon monoxide and carbon dioxide emitted when twigs, dried wood and cow-dung cakes are burnt (see table). “The initiative was launched to improve availability of clean and efficient energy,” said Gauri Singh, former joint secretary, MNRE. But neither the stove nor its fuel is readily available in the market. To popularise its project in community cooking, the ministry launched field testing programmes for community stoves in 2010-2011, and for domestic stoves in 2011-2012. In the nine states, it marked around 30 dhabas, schools and other community kitchens to demonstrate and spread awareness on the benefits of the stove. Deadline for the demonstration programme for community stoves is March 2011, said MNRE officials, but no demonstration has taken place yet. Now, the ministry has also planned demonstrations of 200,000 domestic stoves across the nine states. “India has great potential in this sector but the industry is not growing. 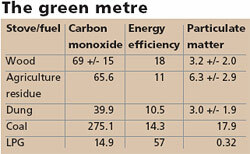 People do not buy biomass cookstoves because they are ‘green’ but because they save time. They know the stove they use are bad for health, but still use them because it is the only thing they can afford,” said Mahesh Yangnaraman, director of First Energy, which manufactures biomass cookstoves. The improved cookstove modelled for home use looks like traditional angeethi. It comes in many sizes but is rarely higher than a foot with a six-inch radius. Some models have long PVC pipes that act as chimneys. The cookstoves are fuelled by small pieces of wood or special pellets made from dried and compressed leftover agricultural waste that emit less smoke and give more energy than dried wood or cow-dung cakes. The pellets are not readily available in the market, forcing one to keep the traditional stove as an option. Fuel cost is also a problem. The pellets have become expensive—from Rs 5 per kg a year back to Rs 8 per kg now. “In the last four years, we have sold 4,75,000 stoves. Now, I am sure 30 to 40 per cent of them are not being used because of high fuel cost,” said Yangnaraman, who is also a member of NCI’s steering committee. A fuel-support mechanism is required for phasing out the traditional stove. The government also needs to encourage this shift. “While the real need for these stoves is individual, community stoves seem to be doing better,” said Kirk Smith, professor at Berkeley University. He has worked on programmes across the globe promoting smoke-free stoves. 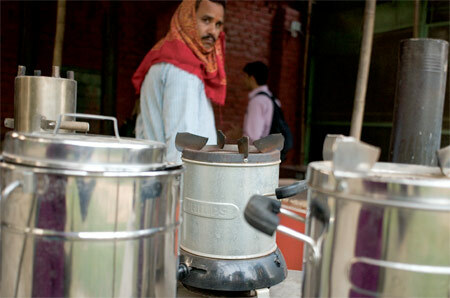 Community stoves are used in dhabas, restaurants and schools. Most companies manufacture both domestic and community varieties. MNRE has certified three manufacturers for community stoves and four for domestic stoves. These are exempt from excise duty. First Energy Private Limited, which produced the most popular model of smoke-free stove in July 2010, also came up with its first community stove, Jumbo Oorja. It costs Rs 9,000, half the amount required for installing LPG gas stoves. Depending on the heat intensity, seven kilogrammes of pellets can burn up to three hours. Philips’ community stove costs about Rs 12,000. “Market for the stoves has not taken off as most models either need pellets or firewood of a particular size,” said Smith. Popularising the stoves is a challenge. “We cannot perform door-todoor demonstrations for individuals. We hope that once the stoves are installed at community places, people will be encouraged to buy them for domestic use as well,” said Negi. The community model does not need subsidy and can survive in the market on its own. First Energy has four models—three domestic and one commercial. The domestic models are Ecooorja (Rs 950), Oorja-plus (Rs 1,250) and Oorja-super (Rs 1,675). Oorja-super is closest to an LPG stove. These work for an hour and need half kg pellets. Philip’s domestic stove costs Rs 3,600. “The stove should be marketed in such a way that all its advantages—cost, health, time and efficiency—are highlighted,” said Ambuj Sagar, a professor at IITDelhi, who has worked on promoting healthier biomass stoves. Government’s assistance is necessary for promoting domestic stoves because fuel cost is too high for the rural population. The government can initially subsidise the fuel or stove and increase the price later. “We need a marketing strategy that will encourage people to use them,” Yangnaraman said. Smith suggested the government could announce a special scheme under which any woman who comes for preor post-natal care will get a stove free. The MNRE has developed four laboratories to test efficiency of the stoves. They are located at IISc-Bengaluru, IIT-Delhi, Maharana Pratap University of Agriculture and Technology in Udaipur and the Institute of Minerals and Materials Technology in Bhubaneswar. “In the past six months, we have received seven to 10 community models for testing. The laboratories are deficient in manpower and equipment. They need large-scale funding,” said Professor Rajinder Prasad of IIT-Delhi. At present, the efficiency test must be done keeping in mind four parameters: a) thermal efficiency must be at least 25 per cent, b) carbon monoxide and carbon dioxide ratio must not be greater than 0.04, c) total suspended particles must be less than 2 milligrams per meter cube, and d) surface temperature must not be greater than 80° C.
The Bureau of Indian Standards had set this benchmark way back in 1991. In collaboration with scientists of the four laboratories, the government is now working to upgrade the standards and testing protocols. This will become effective in about four months. According to WHO, Every year 5,00,000 women and children in India die of indoor air pollution caused by inefficient wood burning stoves. Many improved cook stoves are confined to labs and research institutes. Cooking methods are a combination of fuel available , stove building skills, culinary habits. Many improved cook stove models like Rocket Stove , TLUD made of mild steel, ceramic, fired clay are available. Extensive training of village blacksmiths, village potters, local artisans ( known as sikhligars in south) alone will lead to large scale adoption of improved cook stoves. Any stove made at a central location, subsidised by government, made of material not available locally, implemented by government agencies is doomed to fail as is happening for the past 30 years. i wood just like to get price list of oorja jumbo K 30 and the cost of pellets to be used for the stove in ANDHRA PRADESH . As far as I think the above stove works on wood gasification, whether its a true TLUD or not, I am not sure, the smoke that comes out of wood stoves is basically CO, traces of Hydrogen and Methane and Tar which all can be burned to gain useful heat. A wood gasification stove works by preheating extra air and combining it with wood gas for nearly complete combustion, also to control the production of wood gas the burning of biomass/wood/fuel is controlled by controlling the air provided to it. If sufficient air is provided to burn fuel in a normal stove, complete combustion may take place but the fuel will be consumed very rapidly, a similar concept is for a fluidized bed combustion system and it is applied for large boilers and/or power plants. The key here is to create enough turbulence so that air combines with the produced flue gases before it exits the burn chamber. Stoves that work on turbulence are also called fan jet stoves, which I believe was said by Mr. Paul S. Anderson aka Dr. TLUD. More than half of the Indian woman in the rural areas suffer from respiratory issues due to inhaling smoke from the kitchen. With the launch of the biomass stove, a change can be made. But the government need to have a better marketing strategy.